Save the Maximo Gomez (Domino Park) Mural by the late Oscar Thomas Sr.
My name is Dr. Tasha Thomas and I am the daughter of the late Oscar Thomas Sr. My father was the artist commissioned to paint the mural at the popular tourist site located at the Maximo Gomez Domino Park for the first Summit of the Americas that was held in Miami, Florida. This year marks twenty years since my father passed away and this is one of the last murals my father painted before his untimely death at the young age of 41. 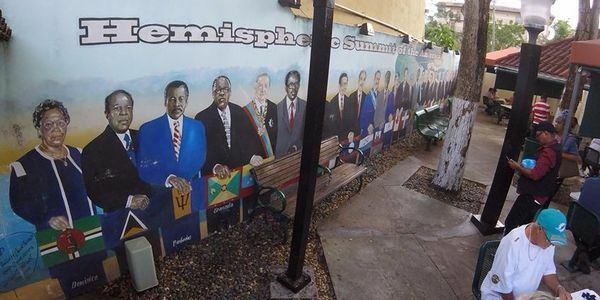 As a black Latino, my father was honored to be chosen to depict notable leaders in Little Havana, particular so many of minority status and African descent. To my knowledge, to date, there are no other displays of such prominent afro figures anywhere in Little Havana. My father’s art has been the topic of discussion to millions of tourists and locals over the past two decades and should be considered an historic site not to be painted over or replaced. This particular mural has been published in several notable travel/tourist books including Lonely Plant. I learned of the possibility of his work being replaced with a water fall structure. This cannot happen. I would like to ask for your support in preserving this important mural. In researching my father, he has been featured in over 100 articles in the The Miami Herald, El Nuevo Herald, Biscayne Times, Miami Times, you name it for his community service and artistic talents. It would be an injustice to the city of Miami and my father to remove his mural.